Step aside chocolate, move over gooey cheese and out of the way fries and garlic aoili. You’re all good, actually you’re all darn awesome but without a doubt my absolute very best most favourite food in the world is raspberries. Even better, raspberries that are picked straight from the bush and are still slightly warm from the summer sun. Bliss! Heaven! Ahhhh! I can’t get enough. I have been known to eat a couple of punnets in one sitting. But that’s okay right? They’re fruit, they’re healthy and they’re good for you right? They are actually very good for you (maybe not in the quantities I can consume them in). Raspberries are high in antioxidants and high in a diverse range of anti-inflammatory phytonutrients. I was told by a berry grower at a farmer’s market the other week that black raspberries are even better for you, not sure if that’s true or not, but I’ll believe it. Hang on, who knew there were black raspberries? Along with the most common red varieties you can also get purple, blue, golden and yellow varieties. Unfortunately where I live here in Auckland we have a very temperate sub-tropical climate. That’s great for not needing big bulky coats in winter and for enjoying gorgeous warm summers, but not so great for growing my dear friend the raspberry. It needs a nice cold winter, which we don’t have, so we don’t see many raspberries for sale around these parts and when we do I’m sure they are the same price as saffron i.e. super-duper expensive. Of course, I cave to the prices and will buy the occasional punnet to fuel my addiction, or even better, if I’m lucky enough to go home to see my family down south where it gets cold enough for prime raspberry growing) I’ll go raspberry picking, otherwise my life is altogether lacking when it comes to raspberries. 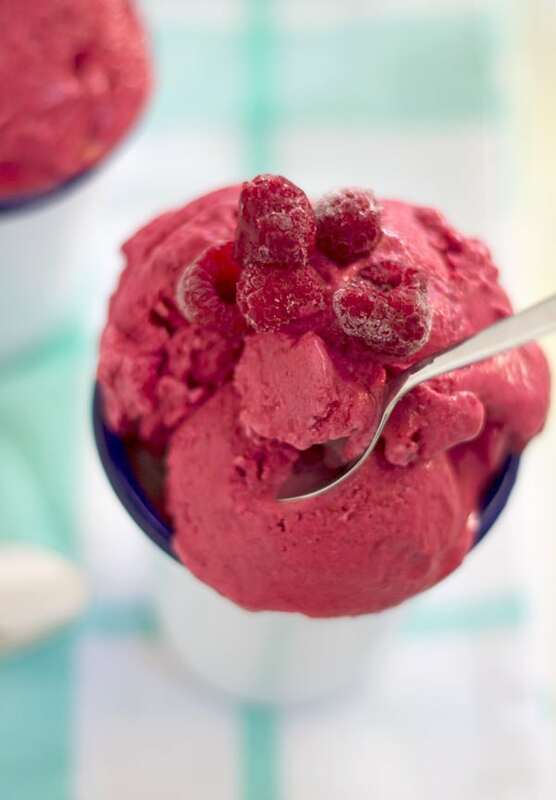 While frozen raspberries are great for cooking, baking and coulis generally I don’t think they cut the mustard – that is until I came across my Cheat’s Raspberry Ice Cream. This really is so raspberrily (yes i know that’s made up but I’m going with it) good that it actually satisfies my compulsive addiction. When I was younger my mum and I used to make a variant of this with cream and icing sugar, which is really good, but changed it up a little as I wanted to make it a little healthier for you all (because if you’re anything like me, once you make this recipe you’ll be making and eating A LOT of it!). So goodbye cream and refined sugar and hello Greek yoghurt and maple syrup – equally as yummy and just as creamy but so much better for you. Also, did I mention this is a cheat’s ice cream? No ice cream machines needed around here. Who has an ice cream machine anyway? If you do, I just say that because I’m super jealous by the way, I wish I had one but there’s just no room for heavy machinery in my 1.9 square metre kitchen. 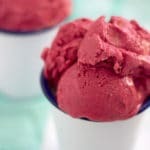 So for the Cheat’s Raspberry Ice Cream all you need is a blender or food processor (the only piece of heavy machinery that is a must in any kitchen in my opinion) or even a stick blender at a pinch and five minutes. Easy! Also because it uses frozen raspberries you could make this absolutely any time of year – great in summer just as is for a quick and easy dessert, or perfect with a gooey warm brownie in the middle of winter. 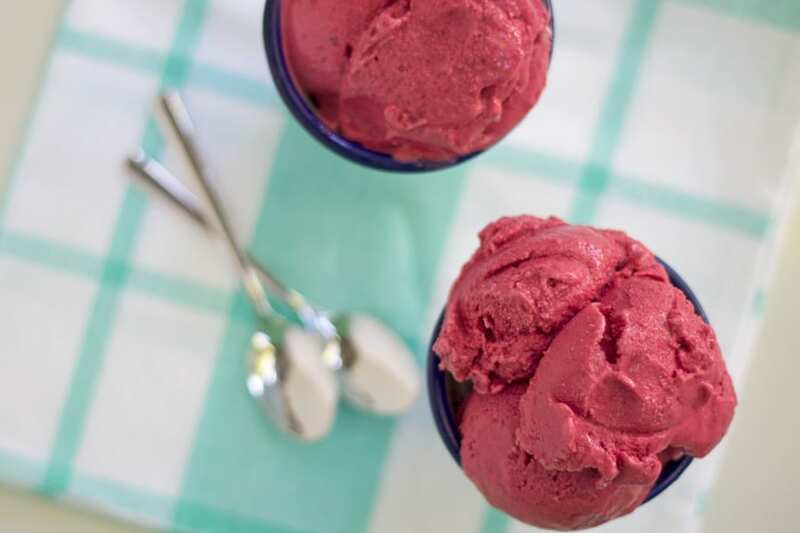 Whether you love raspberries as much as I do or not, I think you’ll love this ice cream, why not make it tonight for dessert? You’ve got nothing to lose, only five minutes of your time! 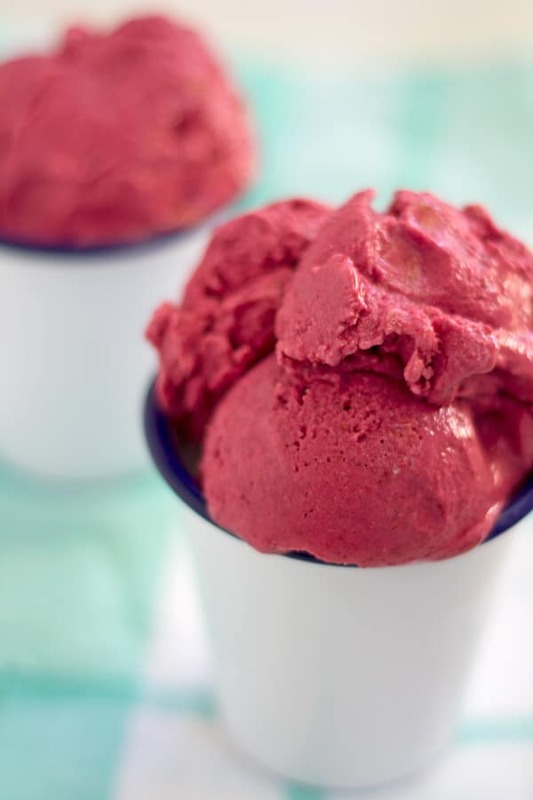 Place raspberries, yoghurt and 2 Tbsp maple syrup in a food processor or blender and pulse for approximately 30 seconds or until the mixture reaches a smooth ice cream consistency. Taste, and if required add additional maple syrup. I prefer my ice cream rather tart so I only add 2 Tbsp; however, if you prefer it a little sweeter I recommend 4 Tbsp (or more). Serve immediately. See note 1. The consistency of the ice cream is quite soft. If you prefer a firmer consistency I recommend returning the ice cream to the freezer for approximately 3-4 hours. On the rare occasion you have uneaten ice cream, this can be stored in the freezer. Note, this will harden; however, when you come serve it again leave it out of the freezer for approximately 20 min then break it up and mix it together before serving. It would harden a little, but I think it would be a great idea to make into ice blocks. Yum! I’ll definitely be trying it!